Striking the perfect balance between form and function, the Struct lavatory faucet adds an unmistakably bold statement of confidence to any smart interior. The clean minimalist lines make this faucet the perfect addition to a contemporary bath and the chrome finish emphasizes the modern tubular shape while adding sparkle to the bath. You can install with confidence, knowing that Delta faucets are backed by our Lifetime Limited Warranty. Across the Eurocube range, cut-out detailing on the lever handles reduces the perceived volume of each piece, while highlighting the minimalist appeal of the collection. Eurocube Lavatory Centerset offers a sharp, tailored look in the bathroom. Perfectly aligned to the design needs of today's Cosmopolitan consumers, this collection offers cutting-edge, geometric styling at an unbeatable price. 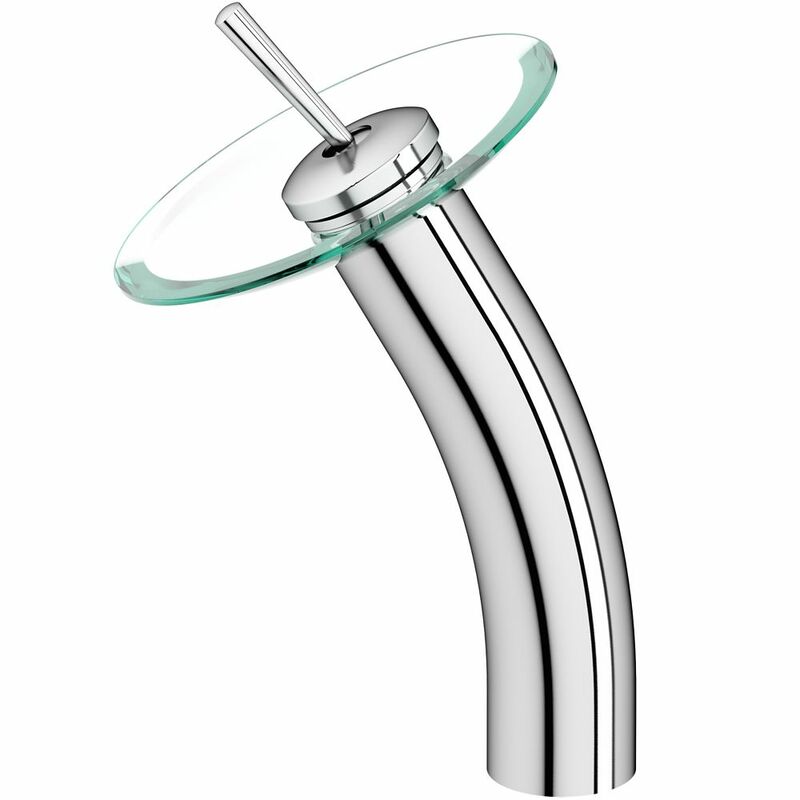 VIGO Single-Handle Waterfall Faucet with Clear Disc in Chrome is rated 4.7 out of 5 by 77. Rated 4 out of 5 by BBNYC from Hello My husband and I also bought this Vigo Glass Faucet , But I have a problem when I had an o... Hello My husband and I also bought this Vigo Glass Faucet , But I have a problem when I had an old faucet the water pressure was fine. Installing this new faucet the water has no pressure at all of what so ever, would anyone know what I can do to fix this issue? Any response would be gladly appreciated. Rated 5 out of 5 by Anonymous from Looks great Be sure to consider the fact that the bowl is glass and you can see every spot from both sides. Also Vigo, in my opinion, should have included a template for suggested location of sink and faucet. Otherwise we are left to experiment on our own. Rated 5 out of 5 by Greg000 from Looks amazing All parts fit well and the finished product looks fantastic. Really happy with this purchase. Rated 3 out of 5 by Nicole from The faucet is huge. Didn’t realize it was so big!... The faucet is huge. Didn’t realize it was so big! Rated 5 out of 5 by Ptrap from Awesome product I bought the sink and faucet approx 8 months ago, they work great and look great as well. Rated 5 out of 5 by NP61 from Excellent product I bought the Vigo sink and faucet about 6 months ago. It is a great product, easy to clean, good quality glass, and so pretty and modern looking. I get compliments for it all the time. I highly recommend it!